Large waterproof storage bag with multi-use storage compartments, made from hard-wearing waterproof polyester material. Large waterproof storage bag with multi-use storage compartments, made from hard-wearing waterproof polyester material. 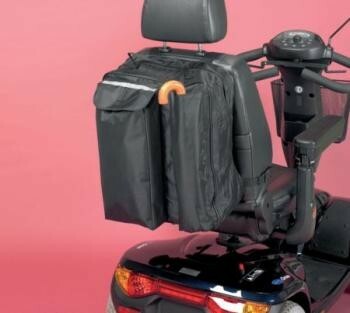 Features a large, zipped main storage compartment with a handy, quick access pouch on rear of bag with hook and loop fastener. The side pouch holds two crutches or walking sticks. When possible, adjustable crutches or walking sticks should be reduced to minimum height for safe carriage. Extra large storage capacity of 27 litres.